SatTrackCam Leiden (b)log: Magnificent view of Shuttle and ISS just before docking! Magnificent view of Shuttle and ISS just before docking! 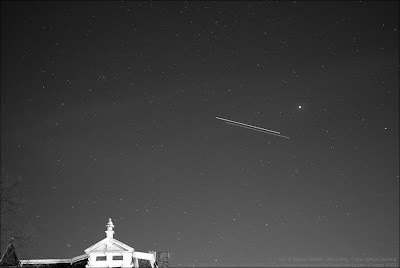 I had a pass of the Space Shuttle Discovery STS-119 and the ISS this evening about one hour before they docked. This meant they were moving as a very close pair. 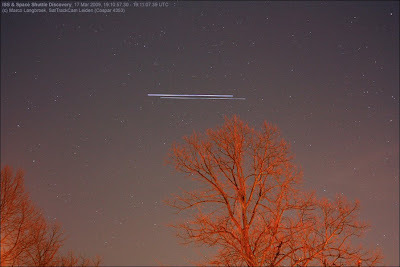 The pass was around 19:10 UTC at 25 degrees altitude. Mooie foto's! Mag ik ze ook plaatsen op m'n website (astroblogs, je kent die wel)? Uiteraard met bronvermelding. Observed the same beautifull sight see here. How many seconds exposure time did you use? I think the reason for the faintness of the shuttle on my picture is because of the long exposere/ISO speed. The difference is due to your lower ISO setting, higher diafragma, and smaller lens aperture. The exposure time itself (10.05 seconds in my case) isn't that much of a factor. What where the settings fot your picture? If I had the same exposure time (1 minute 33 seconds) and a higher ISO (say ISO 800 as I can see you used in some of your pictures), I probably get totaly washed out shots.